Düsseldorf, Germany – During the Battery Show 2019 in Stuttgart, Henkel will launch new technologies that enable cost-efficient large-scale assembly and lifetime protection of battery architectures. As all major automotive OEMs and new players are rapidly launching new electric vehicle (EV) models, Henkel is leveraging its broad technology base and many years of expertise and experience to drive the transformation from traditional engines to electrified powertrains. Tap into the Henkel know-how and visit the expert team at booth 1025 from May 7 to 9. 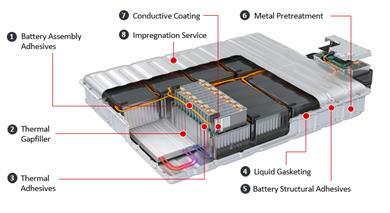 Figure 1: Henkel provides a comprehensive technology portfolio and application know-how for efficient assembly, operational safety and lifetime protection of battery cells, modules and pack.